Summer has arrived- almost- in Cody, Wyoming! Situated just outside of the East Gate of Yellowstone, tourism makes the town come alive in summer, and Cody's a place that embraces and cultivates that image of the Old West. Well, since Buffalo Bill Cody founded the town, perhaps its fair to say that this is where the myth of the Old West was born. Fast forward a 100 years or so, and there are still cowboys roping and branding cattle. It's a subtle but definite culture of picking oneself up by the boot straps, working hard and loving nature. Along with that is a side to Cody of great (Western) art, but there is also this- embracing the kitsch. And I know it seems a bit, well, touristy and that everyone is into "not being the tourist," but here's a hint: you can't not be. You Aren't From Here. Just don't wear a straw cowboy hat and we'll consider it good. Part of the fun through can be embracing being a tourist and enjoying the kitsch. That's why I love our West Strip, such as it is, with its cut-out cowboys and wanted posters for the Wild Bunch, and little mom-and-pop diners like this. Luckily, judging by the increase in traffic and the sudden, festive air downtown, I'd say that many visitors are plunging into all the fun that Old West image has to offer. It's a bit discombobulating, actually, having so many tourists, since school is still in session, but today's the last day! I've throughly enjoyed my first year teaching and am passionate about Gifted Education, but I'll admit, I'm looking forward to summer! Much of it will, of course, be working on classes for next year, but we can get in some summer fun too. 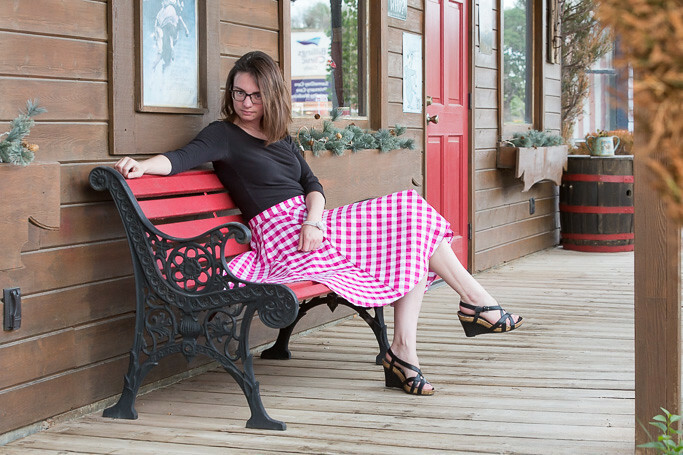 As for the outfit, this checkered red skirt just seemed to radiate Summertime, and I've worn it countless times since getting it. 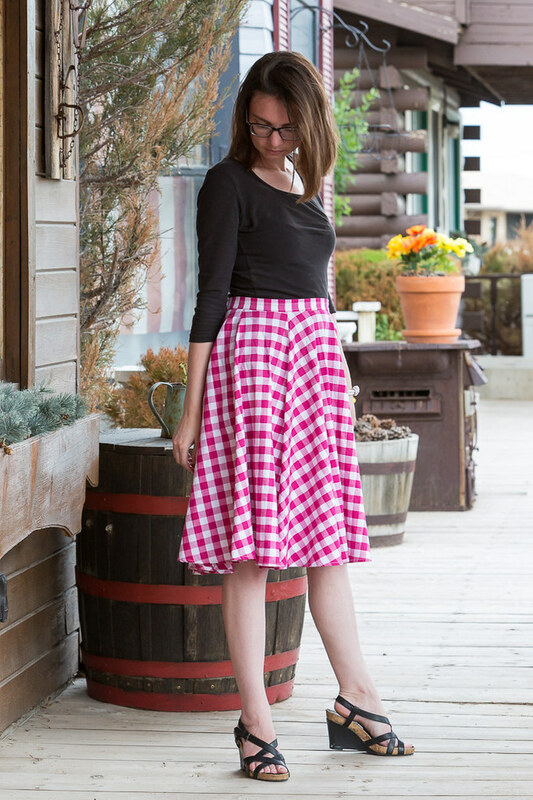 Remember how my shopping list included a full, midi skirt? Well, I got this one at the same time as I got this, because who could make up their mind between two such lovely skirts? This one is from Shabby Apple and I'm always surprised I don't see their stuff on more blogs. It is affordable and high quality; ethically made; and it donates part of every purchase's profits. Win-win-win! So, what are your summer plans? I adore this skirt on you! One of my favourites for sure. Such a lovely outfit, Love it! I love that skirt! 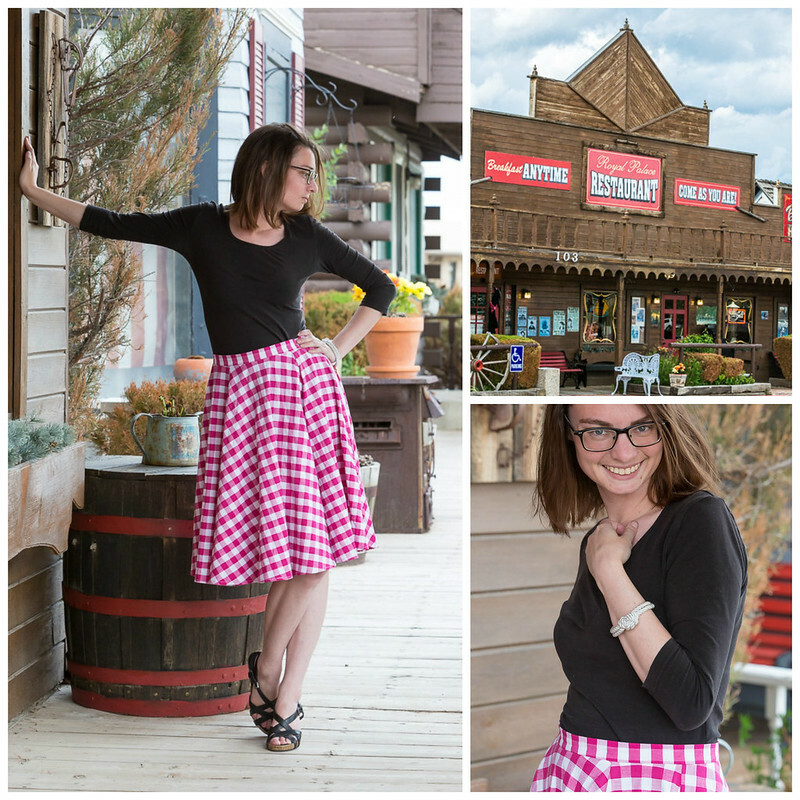 It's been a while since I shopped Shabby Apple, but you are right that their quality is excellent. Ha! I grew up in Wyoming, so it is hard to compare it to other places but, based on my travels.... Wyoming is a lot less populated, so it is quieter than most cities (Er, we don't have any cities in the state at all actually), and there is more space. Some who visit say that freaks them out, actually, all the wide open spaces. We have a lot of nature on all sides and it is close by (I live in a mountain basin). There aren't a lot of things people take for granted in other parts of the country like restaurants, movie theaters or chain stores. Even Walmart is fairly rare. That's great in some regards (I tend to find "suburbia" very discombobulating as it feels like miles upon miles of the same ugly store fronts...). But it also means you are far away from any of these things and have to travel if you want to use those stores or if you want services like hospitals etc. Wyoming also is very conservative and there is not a lot of diversity. It does have what I call "Cowboy Culture." People are very rugged and independent, and want and expect others to take care of themselves. It comes from that pioneer/homesteader mindset. But then, they can be very big hearted and everyone knows everyone else (not just in the towns but all over the state everyone knows everyone). There's a lot of cowboys and they listen to country music and hear cowboy hats. Everyone camps and hikes. You're embracing the kitsch like no other! ^_^ I love pink checkers, there's something very American about them! Love the bright skirt. <3 Perfect! Hmm.. my summer activities are always fluid, but I can count on alcohol being involved in some way, shape or form. Haha. Perfect combo :) Cody looks great, made me think about your hen party.